The 16 Days of Activism against Gender Violence is an annual worldwide campaign to raise awareness and inspire action to end sexual and gender-based violence. The campaign starts on November 25th, International Day for the Elimination of Violence against Women, and ends on December 10th, International Human Rights Day, to emphasise that violence against women is a violation of human rights. The United Nations designated orange as the official colour of the campaign to symbolise a brighter future, a world free from violence and abuse, for women and girls. 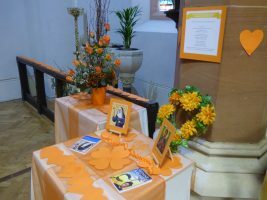 Please take a moment to look at the floral display at the back of church and pray for victims of abuse, for those who support them and for those who campaign for an end to all gender-based violence.